First came folk art, but then came wealth and fine art. By the late 1800s New England had produced fine artists, and its tycoons had collected fine art from around the world. All of it is now in dozens of fine art museums. 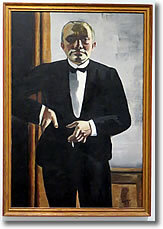 Self-Portrait in Tuxedo by Max Beckmann, Harvard Art Museums, Cambridge MA. Wealth supports fine art, and as the region that produced America's first millionaire, New England has always had men and women with the means to form superb collections of fine art. Then there are New England's dozens of great colleges and universities, many of which began collecting art for educational purposes in the 19th century. Colonial women produced wonderful patchwork quilts which were both practical bed-coverings and delightful works of art. Sailors, particularly those on the whaling ships which might be at sea for months at a time, carved household utensils, buttons, letter openers, and corset stays from whale bone and tooth. Often these objects were decorated with etched designs known as scrimshaw. The delicacy of scrimshaw scenes, which often feature ships and other nautical subjects, are amazing not merely because the artists were self-taught, but because their tools were sometimes no more refined than a pocket knife. The Shaker religious communities in Maine, New Hampshire and western Massachusetts looked upon honest work as a prayer, and each object crafted by hand as an offering to God of one's labor and creativity. Pieces of Shaker furniture, especially the famous Shaker chairs, are valued heirlooms and antiques today. Metalworking was highly advanced as well. Besides being an active patriot and partisan of the American cause, Paul Revere (1735-1818) was a renowed silversmith. His simple, harmonious design for a silver or pewter bowl ("Revere bowl") is still a favorite among connoisseurs in New England. Painting was a craft, then an art in New England. The primitive works of untrained daubers decorated many a colonial household. Fine portraits of the great and powerful graced the mansions of the upper class. During and after the Revolutionary War, painters turned their efforts to the American cause, turning out patriotic works that are still revered. Archibald Willard (1836-1918), whose famous painting The Spirit of '76 hangs in Abbot Hall, Marblehead MA, was trained to decorate carriages but soon showed his skill with oil on canvas. During the mid- and late 19th century, New England's world-class painters had to move to more sophisticated regions in order to prosper and be recognized. James Abbott McNeill Whistler (1834-1903) was born in Lowell MA, and though he lived abroad for much of his life, New England still claims him as one of its own. After living in St. Petersburg and Paris, he established himself in London, where his belief in "art for art's sake" was unconventional. While others were making paintings of almost photographic quality, Whistler held to his credo that a painting was essentially an "arrangement of light, form and color." His most famous painting, of his mother sitting in a chair, is actually entitled Arrangement in Grey and Black, though we know it as Whistler's Mother. Whistler's Girl in a White Dress hangs in the National Gallery in Washington, DC. John Singer Sargent (1856-1925) was born in Florence, Italy, and worked mostly in Paris and London. But his portraits of many famous and socially prominent Bostonians and other New Englanders hang in Boston's Museum of Fine Arts. In the 1890's, Sargent did a series of murals depicting The History of Religion for the Boston Public Library. An earlier painter of the same last name, Henry Sargent (1770-1845), was born in Gloucester MA, and studied in London with Benjamin West. 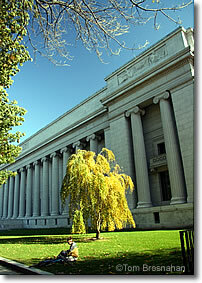 Two of his most famous works, The Tea Party and The Dinner Party are in the Museum of Fine Arts in Boston. His famous portrait of Peter Faneuil hangs in Boston's Faneuil Hall. By the turn of the century, New England had painters content to use local scenes as subject matter. Childe Hassam (1859-1935) was born in Boston, and though he studied in Paris, he returned to his native city to create enchanting Impressionist-influenced paintings of Boston Common, the Isles of Shoals, and a church in Gloucester. Winslow Homer (1836-1910), also a Boston native, began his career as a magazine illustrator of Civil War scenes, but took up painting full time at the age of 40. His direct, realistic and colorful style was just right for the nautical and coastal scenes he favored, taken mostly from life in Maine. 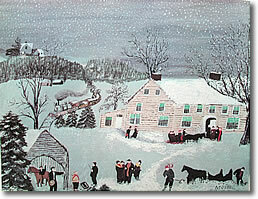 Though Grandma Moses (Anna Mary Robertson Moses, 1860-1961) did most of her painting in Washington County in New York state, her themes and subjects are familiar to New Englanders. The Bennington Museum in Bennington VT, just across the state line from the painter's home town of Hoosick Falls, New York, now holds an outstanding collection of her charming primitives. Most were painted after the artist's 70th birthday, some when she was over 100. Above, Museum of Fine Arts, Boston MA.